An underactive thyroid is frustrating enough, but it can also put you at risk for diabetes, heart disease, and metabolic syndrome. Learn how this special herb can help! Individuals with an underactive thyroid all understand the struggle: each day, finding the energy to deal with your responsibilities is an uphill battle. But beyond your symptoms of fatigue, weight gain, cold intolerance, and depression, there are other dangerous imbalances lurking in the corners of your body. Low thyroid issues significantly increase your risk of developing metabolic disorders such as cardiovascular disease or diabetes. Individuals with hypothyroidism often have higher triglyceride and LDL levels in addition to weight gain and heightened inflammation. Ultimately, these imbalances create a perfect environment for disease risk factors. This can mostly be attributed to the fact that a majority of underactive thyroid cases are caused by an autoimmune disorder called Hashimoto’s thyroiditis. This condition increases inflammation that loves to disrupt your cholesterol and fat metabolism. In light of this, you can understand why I was so enthusiastic about some new research I came across recently. 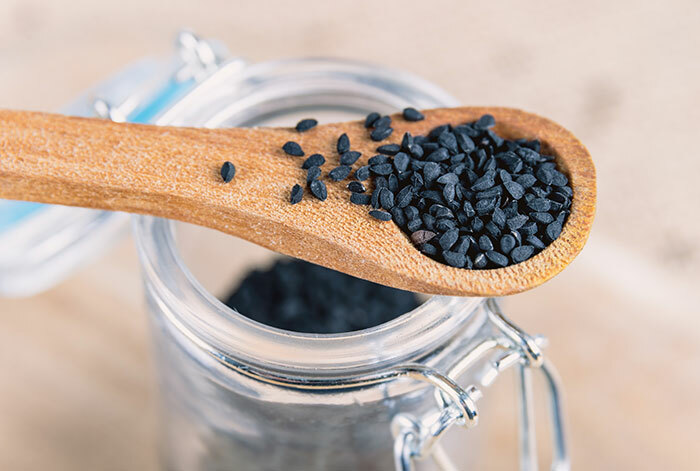 Recent studies have found that there’s an herb out there– black seed cumin– that can help those with an underactive thyroid combat their conditions and decrease their risk factors for other health complications. Scientifically named Nigella sativa, black seed cumin has been a staple in medicine for centuries in cultures across the globe. The golden nugget in this herb is thymoquinone, a compound that gives the cumin its benefits. In the study I mentioned before, researchers gave participants black seed cumin powder for 8 weeks, and the results are incredibly promising. Individuals with an underactive thyroid often have issues excreting LDL from their bloodstream, a problem that results in high LDL cholesterol. Researchers believe that many of the health benefits surrounding black seed cumin oil come from its tendency to increase bile synthesis, which makes excretion more effective. That, along with the antioxidant properties that aid your liver in cleaning out your LDL and decrease your body’s absorption of dietary cholesterol. Metabolic syndrome and cardiovascular disease become real threats when we see small-particle LDL, cholesterol, elevated triglycerides, and low HDL in an individual with low thyroid function, so these black seed cumin benefits are really exciting. In addition to the previously mentioned benefits, black seed cumin is a real MVP when it comes to being a powerful antioxidant, which makes it an effective tool for easing inflammation in the body. This will ultimately help restore balance. Cooling inflammation is crucial for individuals who have a chronic condition as a result of autoimmunity because inflammation and oxidative stress will continue to cause damage and promote those frustrating symptoms that weigh you down. While the research in question is new, studies have documented the weight loss benefits of this special herb. This is great news for individuals with hypothyroidism, as stubborn weight gain is often a symptom of the condition. Black seed cumin extract is safe if you take it in the recommended dose, which, for the average adult, is about 1g per day. Even though these results should restore a sense of hope, you should consult a functional medicine practitioner who can help you uncover the root causes of your imbalance. At our clinic, we use the most comprehensive and advanced testing that will pinpoint the specific underlying factors that make your case unique. You’re an individual, and your treatment plan should reflect that.